Armasight's CO-LR-LRF 3rd Gen MG Night Vision Long-Range Clip-On allows you to expand your operations to nighttime by adding a night vision capability to your day riflescope. At the core of the device is a 3rd generation intensifier tube with a Gallium Arsenide photocathode and Manual Gain control (MG). The Armasight's Alpha designation indicates that the tube will provides highest quality and feature a thin film GaAs photocathode and a completely self-contained high-voltage power supply. To extend the life of this device and protect it from an accidental burnout from bright light, the device is equipped the bright light cut-off function. The 1x optical system, expandable up to 12x with optional objective lenses, has an f/1.54 F-number and a focal length of 108mm, and provides a wide aperture for collecting more infrared light to improve visibility. 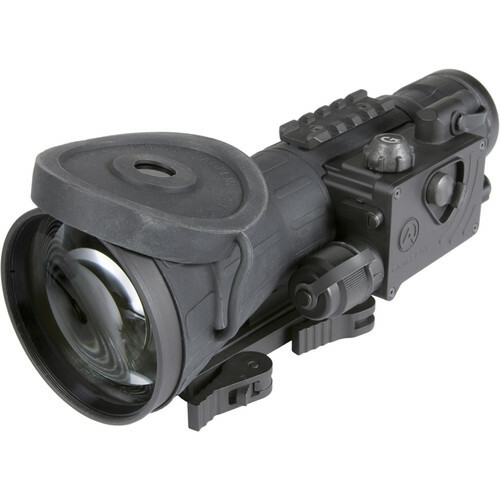 Enabling you to make operations in total darkness, this night vision device includes a XLR-IR850 infrared illuminator that can cast additional infrared light of your targets. To withstand the rigors of harsh environments and demanding situations, the device is outfitted with a housing that is durable, waterproof, and resistant to extreme temperatures. Its design allows you to mount the clip-on directly to the objective bell of your day riflescope or on a Picatinny rail. Note: Export of this device described herein is strictly prohibited without a valid export license issued by the U.S. Department of State Directorate of Defense Trade Controls, as prescribed in the International Traffic in Arms Regulations (ITAR), Title 22, Code of Federal Regulations, Parts 120-130, and/or by the U.S. Department of Commerce Bureau of Industry Security, as prescribed in the Export Administration Regulations (EAR), Title 15, Code of Federal Regulations, Parts 730-780. For further information contact the Directorate of Defense Trade Controls and/or the Bureau of Industry Security.